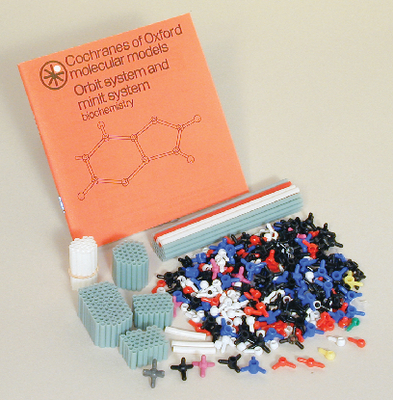 Learn about the chemistry of life with this extensive, pocket-sized molecular model set and manual. The set contains 255 atoms, 220 bonds and a 44 page booklet with building instructions and explanation of the following structures: amino acids; monosaccharides, glycerol, fatty acids, steroids, purines and pyrimidines, peptides, disaccharides, lipids, nucleosides, nucleotides, proteins, polysaccharides, nucleic acids. Parts are interchangeable with other Minit™ molecular building systems.